GM will market most vehicles under Chevrolet name in Korea. 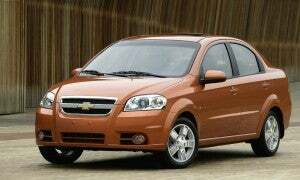 GM Daewoo, best known in this country for producing the Chevrolet Aveo, is being renamed GM Korea. Most of its cars will be marketed as Chevys. GM Daewoo Auto & Technology Co. – better known as GM Daewoo – announced today that it is replacing the current nameplate with a familiar one, Chevrolet. All of the company’s new product introductions and refreshes this year will be under the Chevy badge. Additionally, GM Daewoo announced that it will be changing its company name to GM Korea Co., which General Motors said is globally consistent with all other GM country operations. The company name change is expected to be completed by the end of March. GM said its market research overwhelmingly points to consumer acceptance of the Chevrolet brand in Korea. This year, the company will begin its most aggressive vehicle launch plan in its history and will have an all-new product lineup with the introduction of eight new models carrying the Chevrolet name. The portfolio includes the Chevrolet Camaro, Chevrolet Orlando, the Chevrolet Aveo global small car, as well as a new SUV and a new premium midsize sedan. GM Daewoo’s Board of Directors approved the new name Thursday morning. The current GM Korea will keep its name, GM Korea Ltd., and its focus will remain on the Cadillac brand. GM Daewoo played a lead role in the design, engineering and manufacturing of the Chevrolet Cruze global compact sedan, the new Chevrolet Spark global mini-car, and the new Chevrolet Aveo global small car. The Aveo will be known as the Sonic in the U.S.
GM Daewoo has five manufacturing facilities in Korea and an assembly plant in Vietnam. The Detroit News reported that a few vehicles, including the Alpheon, a large sedan, will not be sold under the Chevrolet brand, said Lim Young-mi, a GM Daewoo spokeswoman, but she didn’t see how the vehicle would be marketed. GM Daewoo, South Korea’s third-largest automaker after Hyundai Motor Co. and Kia Motors Corp., sold 751,453 vehicles last year, with 83 percent of those exported, Lim said. Unlisted GM Daewoo was created after Detroit-based GM acquired Daewoo Motor Co., the automobile unit of the Daewoo Group resulting from its collapse in 1997-98. A few vehicles, including the Alpheon, a large-size sedan, will not be sold under the Chevrolet brand, said Lim Young-mi, a GM Daewoo spokeswoman. Unlisted GM Daewoo was created after Detroit-based GM acquired Daewoo Motor Co., the automobile unit of the Daewoo Group. That conglomerate had collapsed as a result of the financial implosion that hit South Korea in 1997-98, part of the broader Asian economic crisis. This entry was posted on Friday, January 21st, 2011 at and is filed under Automobiles. You can follow any responses to this entry through the RSS 2.0 feed. Both comments and pings are currently closed.